I hope you all had a wonderful weekend doing something you love! My family and I had a great one! The weather was perfect and we had an awesome camping trip with our friends at Cedar Hill State Park which is about 50 miles away from our place. This was where we had our first camping with our DFW circle of friends, and we thought of going back just so we could explore the place, which we failed to do the last time since it was only an overnight camping. I could say we all had a blast! 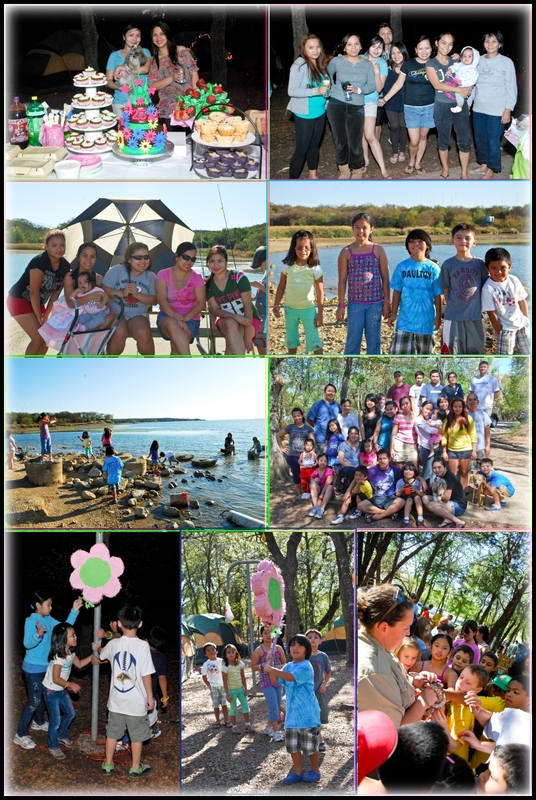 We had our friend's 25th birthday celebration...the boys went fishing...the girls help the kids do some crafts(bracelet and kite making)...and the kids got to watch a reptile show. Though Ryan, Clarise & I suffered much from sneezing, runny nose and itchy eyes because of allergies, the fun, the great food, and camaraderie with good friends made it all worthwhile. This dessert that I'm sharing with you today is one of the stars last Friday night. We had chocolate and peanut butter cake, cupcakes and cake pops as well as apple and cherry cup pies, but this Filipino favorite was a hit! 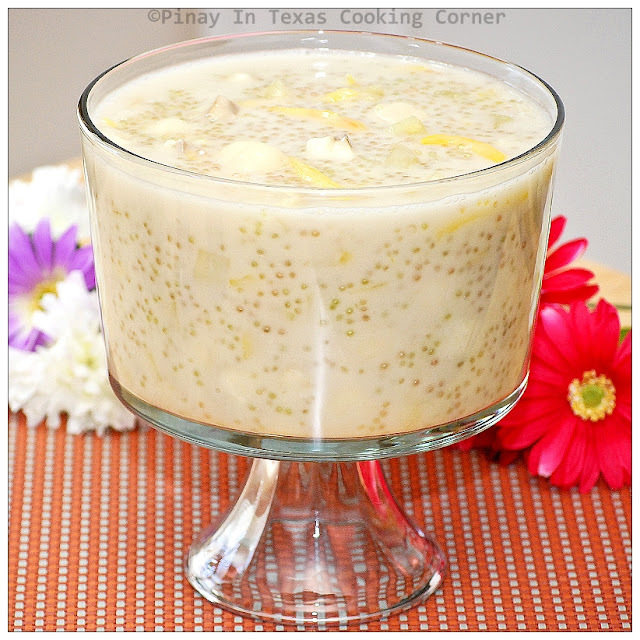 This is called Ginataang Halo-Halo which simply means Mixed Ingredients in Coconut Milk. It is basically a mixture of different tubers like sweet potato, purple yam, and taro root as well as other ingredients like Saba bananas, jackfruit, tapioca pearls, and glutinous rice balls. All I could find was yellow sweet potato so my ginataang halo-halo wasn't colorful as it should be...but it was tasty of course! 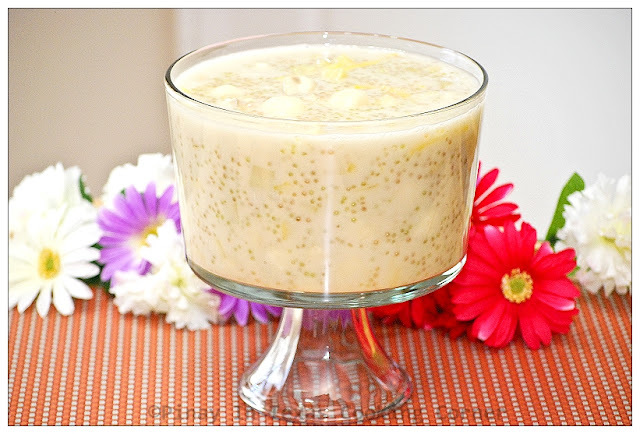 In the Philippines, Ginataang Halo-Halo is served not only as dessert but also as meryenda (mid-afternoon snack). As dessert, it is served cold, and as snack, it is usually served warm. 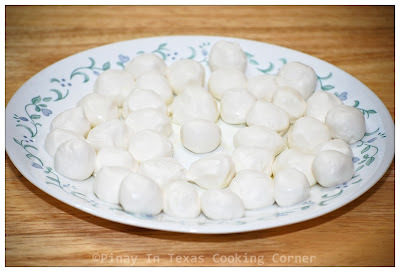 This has been my favorite since childhood, and I love it with lots of glutinous rice balls and tapioca pearls! 1. Scoop about ½ Tbsp of dough then mold into a small ball. Place on a slightly greased plate. Repeat until there's no more dough. Set aside. 2. In a big pot, pour in coconut cream, water and sugar. Cook while stirring until sugar is dissolved. 3. Add tapioca pearls. 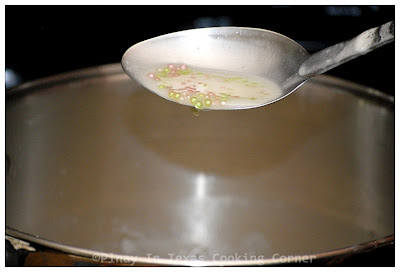 Simmer with frequent stirring for 20 minutes or until tapioca pearls are almost tender and transparent. 4. 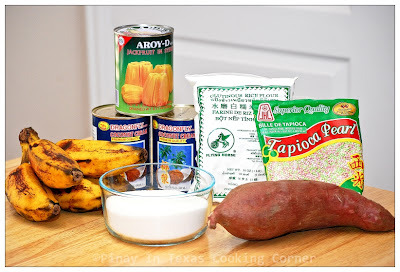 Add kamote and simmer for 10 minutes or until cooked. 5. Add dough balls, banana and jackfruit. Keep cooking until dough balls are all floating. 6. Remove from heat. Allow to cool down. Serve as dessert. Glad you had a great weekend. Love the photos and recipe. Thanks for sharing. Good food and great friends , what more could you ask for ? :) The ginataang mix mix :D looks yum ! I have not gone camping since my school days. Glad to hear youf family enjoys it. good looking ginataang halo halo. you made me crave for it. i want some now tina! can you send some my way? haha! glad you guys had fun... im not into camping but looking how much fun you had made me think why not? right? Looks like everyone had a great time and wonderful dessert! Ooooh I love halo halo! This looks so refreshing! Wow, that's a huge group of friends! So fun :) Thks for sharing this wonderful recipe too! Thats a great time with wonderful friends enjoying the lovely dessert you did. We do have something similar over here, you know Asian desserts sometimes are so strongly blended from country to country. @Malou: You should try going camping! Doing it with your family and close friends will make you love it! I love this idea, Tina! Coconut milk and tapioca pearls..yummy!! By the way great photos, looks like it was so much fun!! that ginataang looks amazing! I have never heard of it of course until now but I do love coconut milk and the tapioca balls in it sound so delightful!